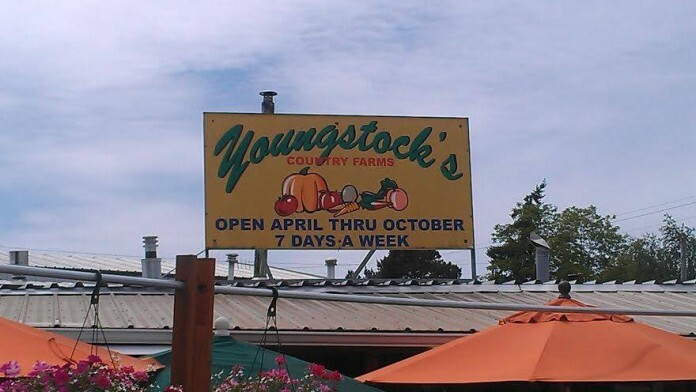 Youngstock's Country Farms is open seven days a week at 2237 James Street in Bellingham. Youngstock’s Country Farms is open seven days a week at 2237 James Street in Bellingham. 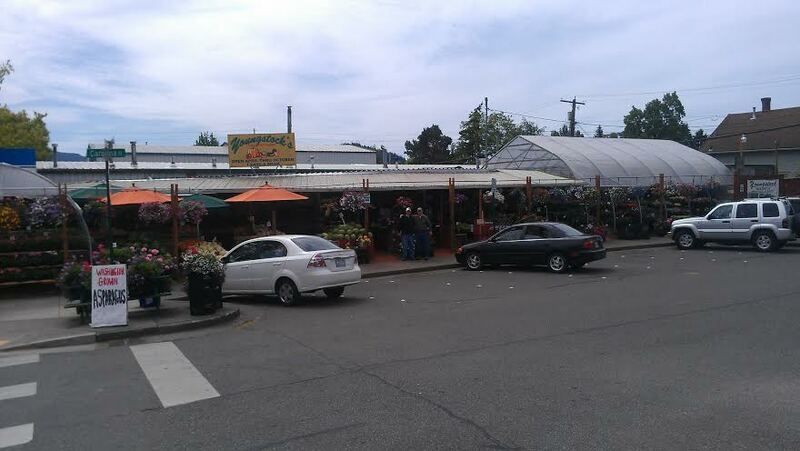 If you’re a Bellingham native, you’re probably familiar with the outdoor produce market located on James Street. Youngstock’s Country Farms has been around for a number of years, and unlike weekly farmers markets that take place just one day a week, Youngstock’s is open daily, April through the Christmas season. 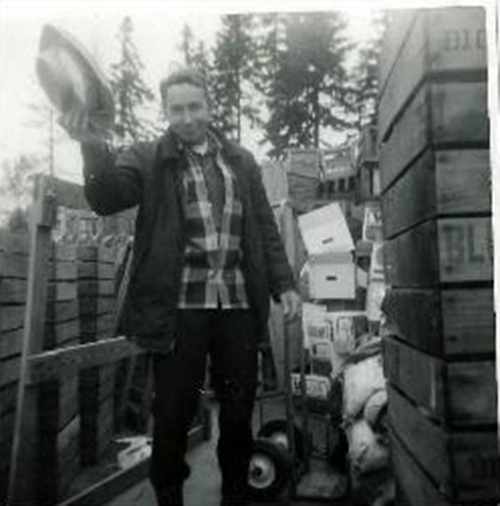 As a Bellingham native, I remember visiting Youngstock’s Country Farms with my mom as a kid. More recently I can recall stepping onto the market’s sawdust floor and soaking up the joyful atmosphere, listening to the light-hearted chatter between workers and customers before happily accepting a sample of white melon from a Youngstock’s employee. Nate Van Tuinen quickly introduced himself as I bit into the cool, refreshing melon. Nate has been employed by Youngstock’s since May and has loved every moment of it. “It’s busy every day,” he cheerfully shares. “Even on the rainy days,” he adds. Washington shoppers aren’t shy when it comes to outdoor markets and ugly weather. And with Youngstock’s vast and colorful selection of fruit and produce, it’s obvious why shoppers have been coming back to this local market for more than 40 years. Founder of Country Farms Jay Waters poses for the camera back in the late 1940s. It was 1972 when John Chartier opened the James Street market, and Youngstock’s has been a local source for all things farm fresh in Bellingham ever since. An affiliate of Country Farms, Youngstock’s is backed by another Western Washington business similarly built from the ground up. During the mid-40s, a man by the name of Jay Waters started selling fruits and veggies from the back of his pickup truck. In the years that followed, Waters upgraded to a bigger rig, and by the mid-1950s he had collected a small fleet of trucks. The small, local produce company currently hauls fresh produce from Washinton, Arizona and California to the five farm stands it serves in Edmonds, Everett, Lake Stevens, Burlington and Bellingham. Today, Country Farms has grown from a one-man operation to a business employing more than 180 people throughout the season. And just as the markets and business have multiplied, the variety of items sold has multiplied as well. While fresh fruit and produce make up the bulk of the items Country Farms delivers to markets like Youngstock’s, the local business also offers a variety of nursery items, dairy products and even Christmas trees during the holiday season. 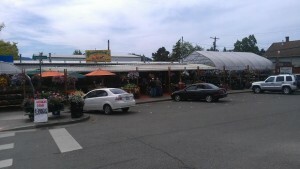 An open air market is something quite different from a regular grocery store. There’s a certain ambiance that it gives off, leaving the shopper to explore something vastly different and much more engaging than a produce section. With Youngstock’s inventory stocked with a variety of items from Country Farms, the feeling you get shopping at Youngstock’s is one reminiscent of community and family. 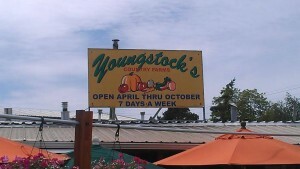 Of course, that could also be because Youngstock’s, like Country Farms, is family owned. Rain or shine, produce-hungry shoppers enjoy loading up on fresh finds at Youngstock’s. Though John retired nearly 10 years ago, he’s always been able to trust in his family to continue the legacy he started so many decades ago. Today Youngstock’s is managed by John’s son, Tristan, who knows the store well. After all, he started working there as soon as he was old enough to walk. After spending four years in the Navy, working as a firefighter and even starting his own tree business, Tristan returned to the family business to continue what his father started. In Tristan’s words, “Youngstock’s is my dad’s legacy.” Continuing Youngstock’s as a family-owned business is important to Tristan not just because it’s a continuation of his dad’s legacy, but because it’s a commitment to the rest of the Chartier’s family: the community. “The customers are the best part of this job,” says Tristan. Backed by the support of the community it serves, Youngstock’s continues to provide fresh produce in the same location where it got its starts so many years ago. Want to experience this outdoor market firsthand? Visit Youngstock’s at 2237 James Street seven days a week, or contact the farmstand at 360-733-1866.